Digimon: System Restore: Fusion Episode 39: The Water Tiger General's Slippery Trap! Fusion Episode 39: The Water Tiger General's Slippery Trap! In this episode, the world shall be saved by steam! And a convoluted, psychological chess match that involves tricking your own friends. But mostly steam. It's easy to forget just how smart Mikey is. Since his return to the Digital World, he hasn't had any opportunities to do anything truly brilliant; the rescue in Dragonland, infiltrating NeoMyotismon's castle and the simple plot to beat Zamielmon are nothing that someone like Tai couldn't have come up with. But this is more impressive. Not only does he rescue everybody who needs rescuing, he manipulates Splashmon into investing time and energy into a plan that is already failing. That's not to say the plan isn't completely far-fetched, or that it doesn't strain how much we're willing to believe Mikey was in control this whole time. Far too much of the plan involved playing along and following Splashmon's puppets. Mikey actually catches a lucky break in something he isn't even aware of: Splashmon's job is to gather negative energy first and destroy the opposition second. Everything Splashmon does, and everything Mikey is able to counter, is for this primary purpose. This includes not only Luca, and capturing Dorulumon and Nene rather than just killing them. If Splashmon was out to simply eliminate his foes, then the entire Luca plan could have centered around leading the Fusion Fighters into all those death traps outside the warehouse door. Seriously, if we're supposed to believe that Mikey had been suspicious of Luca the whole time, then not only is he a great actor, he takes a lot of risks in letting Luca put them in dangerous situations. Even if he's counting on Dorulumon's “instincts” to get them out of obvious traps like drinking or wearing the splashers, his willingness to put everybody else in danger just to let everything play out is irresponsible. At the very least, he should tell someone like Christopher who's unlikely to spoil the ruse. Mikey's plan gets simultaneously more awesome and more convoluted when he starts trying to fool his friends. It doesn't feel like it's all that necessary that he take Christopher and Nene out of the equation. If anything, as much as Mikey puts his full faith in Dorulumon, he's showing a lack of it in his human companions. Otherwise, he would give them a head's up that all this is going on. Even if they eventually separate from him to let him fake his death, why not count on them to act their parts as well? One thing's for sure, while Mikey's got Christopher pinned down pretty well, he can't read Nene at all. 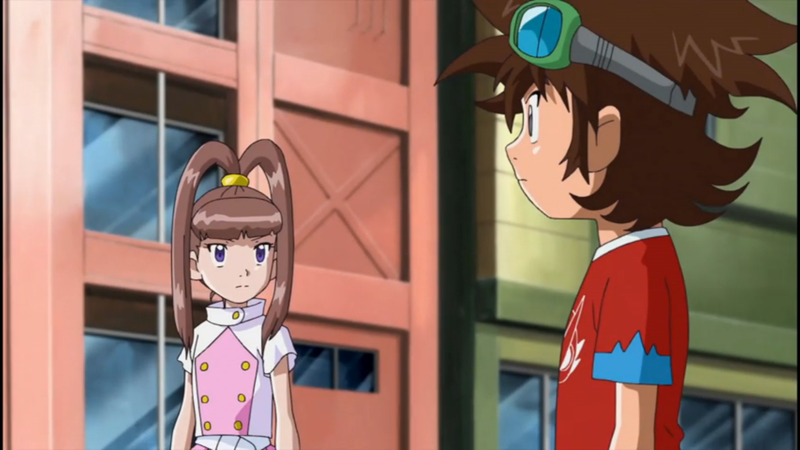 Mikey plays Christopher perfectly, anticipating that he won't believe that Fake Dorulumon is being honest and pushing until Christopher takes his ball and goes home. Again. But he encourages Nene to do the same if she also doesn't agree. Nene certainly isn't convinced that Dorulumon is still with them, but she's also not willing to split the party over it. Somehow he doesn't catch on that Nene is far more rational (at least on matters not concerning Ewan) and less prone to stomping off in a hissy fit. Even when it came to stuff like leaving Team Midnight for the Fusion Fighters, Nene weighed her options before coming to a decision. Mikey's failure to realize that, or alternatively his failure to let Nene in on his plan, almost ruins everything. From there the plan involves great usage of Cutemon, Deputymon, and Ballistamon. Christopher even gets to be clever! The Fusion Fighters expose Splashmon's defeat, confront him once and for all and... well, from there it turns into a normal, conventional boss battle. There's some angst about actually being able to land a hit on a body of water, and that's supposed to sustain the drama as Splashmon's raw power doesn't seem all that scary. Thing is, the solution ends up being a particular attack from Shoutmon DX. Thing is, the last two generals were also defeated by attacks from Shoutmon DX. It may be more fun to evaporate the bad guy instead of just clobbering him, but if the tactics are basically the same, how much difference does it really make? You know all those name captions that pop up at the start of every episode? In between the tags for Mikey, Nene and Christopher, the tag for I Can't Believe It's Not Dorulumon is conspicuously absent. 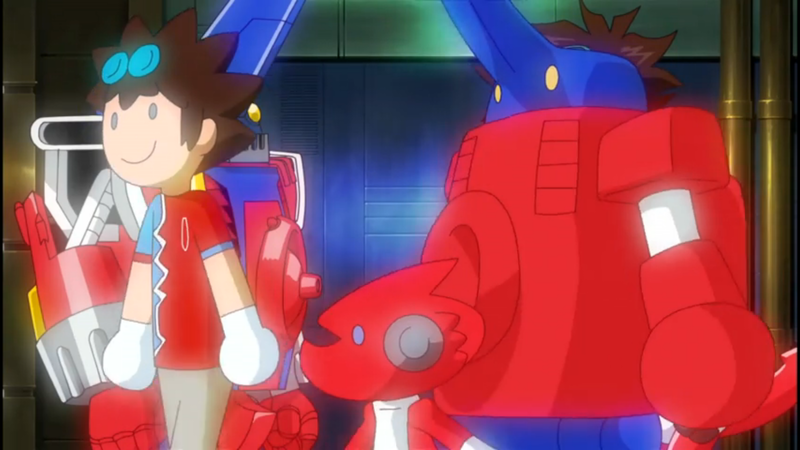 Even if we buy Ballistamon's ability to print convincing enough clones of himself, Mikey and Shoutmon, can we really believe that Mikey anticipated not only that they'd have an opportunity to find a blind spot to send out these clones, but that he also knew exactly where in the alley the trap was? For that matter, we probably shouldn't believe that Christopher happens to have an exploding fake digicard, but it was a cool enough stunt that we're letting it slide. Granted, it's been eight episodes since anyone's used one of those things and it's hard to remember what they look like. Suppose we should say something about Splashmon and his refusal to have anything other than his own puppets for support. Or that he wiped out an entire population by instilling fear amongst them. Thing is, the puppets worked awfully well towards his goals and getting an entire population to kill itself sounds like the kind of over-achieving Bagramon would be proud of. Thank you Ballistamon for breaking up the sappy “faith in friends” talk by echoing calls of Mikey being reckless and stupid. "Suppose we should say something about Splashmon and his refusal to have anything other than his own puppets for support. Or that he wiped out an entire population by instilling fear amongst them. Thing is, the puppets worked awfully well towards his goals and getting an entire population to kill itself sounds like the kind of over-achieving Bagramon would be proud of." I think the point wasn't that Splashmon was (totally) inefficient so much as it was kind of sad that he couldn't trust anyone but himself. Kind of ironic that the guy who sows suspicion among others is unable to view others without suspicion, too. That's why a fusion between Christopher and Mikey should take him down: it's teamwork versus someone trying and failing to do things on their own. Not to mention Splashmon failed specifically because Mikey and Chris knew their team players well enough to smell a rat. It's kind of horrifying that Splashmon managed to do it to an entire land's worth of Digimon, though. That's some nightmare fuel right there, and the episode glosses over it almost as quickly as it's mentioned. Really? Mikey's the first person to figure out Splashmon's part in sowing discord. 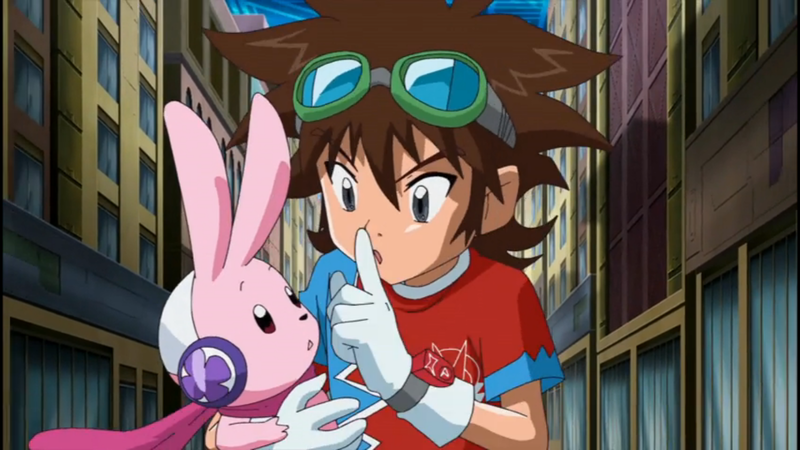 Just what kind of social ties do Digimon have that no one in a whole land of them sussed him out? Also, isn't it counterproductive to wipe out your source of negative energy? It's like killing all your sheep in one go to get as much mutton as you can. "Thank you Ballistamon for breaking up the sappy “faith in friends” talk by echoing calls of Mikey being reckless and stupid." Fusion Episode 38: Psych-Out in Cyber Land!